New Zealand is renowned for its fine natural produce, so while I was on holidays, I decided to engage in some culinary experiences so that I could sample some of the finest food that New Zealand has to offer. 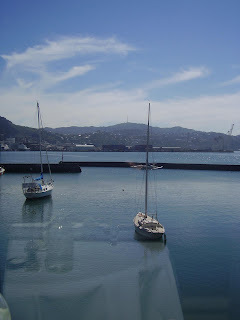 My first culinary experience was lunch at Martin Bosley's Yacht Club Restaurant at 103 Oriental Parade, Wellington. 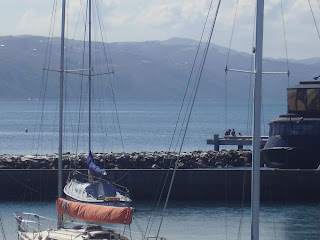 (It is named Oriental Parade after one of the first ships which brought immigrants to Wellington, which was called the Oriental.) Martin's restaurant was awarded best fine dining experience and supreme winner of the Cuisine Restaurant of the Year Awards in 2007. 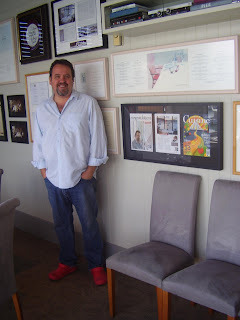 My attention was first brought to Martin's restaurant by an article in one of Melbourne's newspapers, The Age. The layout of the restaurant is bright and open, and the inside tables are arranged around a floor-to-ceiling plate glass window so that indoor diners can also enjoy the view. I was sitting inside against the window and near a side door which had been propped open on this rather warm day to allow a refreshing sea breeze to flow through. While I was waiting for my meal, I was served the complimentary cocktail of that day, called a "Bluebridge" after one of the boats that sails on Wellington harbour. I am not sure of everything in this cocktail, but I can say that it contained dark rum, brandy and lime, and that even though I am not a huge spirits drinker, I enjoyed this light, refreshing drink. I was also served an amuse bouche of an oyster with champagne foam and roe, which was delicious. Martin's speciality and the focus of the menu is on fresh seafood, although there are other items on the menu. I skipped the entrees (so as to have room for dessert ;)), but oysters were among the choices for starters. 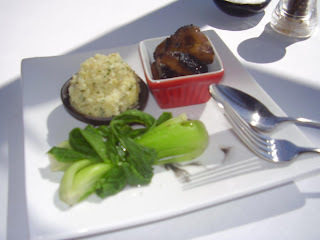 The vegetables were spinach, bok choy, shitake mushrooms, a type of garlic dish and mashed potatoes. The mashed potatoes were very special because they were served in a small pot which made them look for all the world like a pot of butter, and they were smooth, creamy and delicious. The snapper was cooked to perfection and melted in the mouth - definitely a long way from the sometimes rubbery grilled fish that I churn out at home. 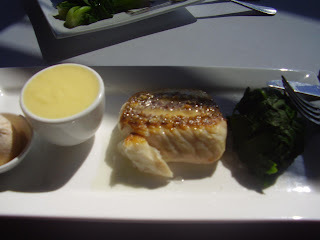 The fish varieties are also served by the restaurant in a number of other ways, but I preferred the simplicity of the grilled fish and vegetables. And oh boy, does this dessert give you reason to love peaches! 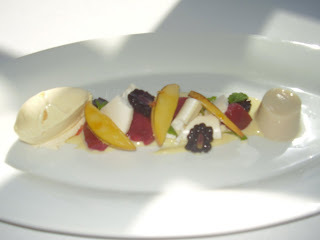 It consists of grilled peaches, peaches poached in red wine and peach icecream, offset by crumbled meringue, lemon verbena custard, blackberries and what looked and tasted like a miniature vanilla panna cotta, all beautifully presented. This combination was so light and melt-in-your-mouth that I was easily able to fit it in. I chose a glass of Momo 2006 Pinot Noir from New Zealand's Marlborough region and a bottle of sparkling New Zealand mineral water to accompany my meal. 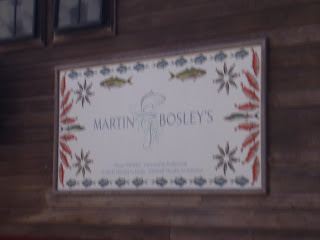 My meal at Martin Bosley's Yacht Club Restaurant was an amazing experience, and was well worth the price. If you visit or live in Wellington, I highly recommend making a reservation at this restaurant - the setting, the service and the food are, IMHO, fantastic, and truly deserve the title of "fine dining". Kia ora from Aotearoa! I am on holidays at present in New Zealand, so it it quite fun to be posting this DB's challenge away from home. This month's Daring Bakers' Challenge is hosted by Morven of Food, Art and Random Thoughts, a fellow Antipodean. She has chosen Dorie Greenspan's recipe for the Perfect Party Cake, from Baking - From My Home to Yours as this month's challenge. 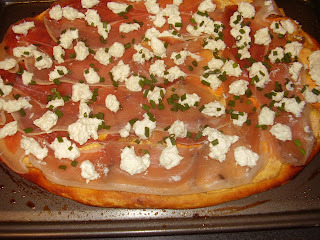 You can find the full recipe on Morven's site, so I won't reproduce it here. Morven was very generous in that she allowed us to put our own "stamp" on the chosen recipe by experimenting with colours and flavours. Initally, I was pleased about this challenge, as the cake in the book looks absolutely gorgeous, and I am, as my pseudonym suggests, a cake baker. I have also previously made two other cakes from Dorie's book, and they were just devine and very unique. However, during this challenge, the base cakes and I had several disagreements, so that I was in fact relieved when it finally came together and I could say that I conquered it. My first problem arose when I left the cakes to cool in the tins for the obligatory 5 minutes or so after I removed them from the oven. The cakes retracted from the sides of the tins while cooling, but each cake stuck to the side of the tin in one spot, so that when the cakes retracted, they tore a little. I next found that these cakes stuck to everything - they unmoulded just fine (even with the little tears), but they then proceeded to stick to the wire cooling rack, to the tray I flipped them onto so that I could line the wire rack with baking paper to avoid further sticking (causing a small hole to be gouged in the top of one of the cakes!) and to the baking paper that I used to line the cooling rack. My final problem with the base cakes arose because the cake layers are not very thick, and when I cut one of the cakes in half (the pristine one without the hole), I cut it so crookedly that I had cut a small hole in the centre of one "half" ( and I use that word loosely). At this point, I decided that there was no going back, and forged ahead bravely, using the most robust layer (sans holes!) as the bottom of the cake. Now, I am not a buttercream fan, and you will notice from my previous posts that I rarely use it. I dislike the mouthfeel of it, which to me is quite greasy. For this reason, I cannot say that I loved this cake (although it tasted just fine). However, I took it into work to share with my colleagues, and most people loved it. (This is significant, because I bake so often now that they don't comment at all unless I really pull off something out of the ordinary.) One person went so far as to say he thought it was "spectacular"! Just goes to show that taste is a very subjective thing. Thanks to Morven for hosting this month's event. You can check out other permutations of this cake via the Daring Bakers' Blogroll, which can be accessed here. As my final pre-Easter creation, I have decided to contribute to Bread Baking Day, which this month is hosted by Susan at Wild Yeast, with a theme of Celebration Breads. Initially, I thought of making hot cross buns, a traditional Good Friday treat, as I have never made them before and I love them. However, I was feeling a little extra daring, and instead, I have made Russian Easter Bread. In addition to the traditional shaped loaf featured at the top of this post, I reserved some of the dough and made four little buns as gifts to go with the marshmallow bunnies that are still surviving. These buns are pictured at the foot of this post. 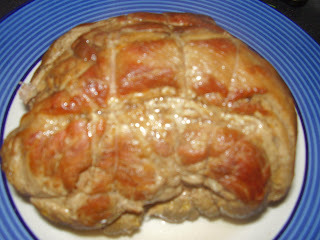 The recipe that I used for the Russian Easter Bread can be found here at Taste.com.au. I found this recipe really easy to follow, and it went off relatively hitch-free. However, I did need more than an extra cup of flour than the recipe suggested, and my decorative eggs stayed stubbornly un-coloured, even though I upped the ante with the food colouring substantialy to the one teaspoon stated. The only changes that I made to the recipe were to replace the sultanas and lemon rind with mixed dried fruit left over from Christmas, and to glaze the finished bread with sugar syrup to imitate the stickiness of hot cross buns. (Note that the finished bread is shiny from the egg glaze without the sugar syrup.) I also used fewer decorative eggs, because I made a smaller loaf (due to the buns). I shaped the buns using the same method as for French petit pains, and slashed the top of each bun with a cross. Interestingly, I subsequently found that, despite the title of the recipe that I used, my bread looks nothing like a traditional Russian Easter Bread, known as Kulich. Oh well, it was fun to make, and looks good. I hope that this bread tastes as good as it looks - I am taking it to work for morning tea tomorrow. Fingers crossed! The roundup of celebration breads appears here at Wild Yeast. I will be taking a break from blogging for a week or so over the Easter break, so this will be my last post for a little while. I wish you all a fantastic Easter, and hope you are able to enjoy a break to celebrate the season. Hooray! I received the best surprise in the mail today, because a parcel for Blogging by Mail arrived for me from Smita at Smita Serves You Right. I had it sent to work so that it didn't get sent back to the post office, and had great fun opening it with Patsy and Amy. Smita knows what I love, because I received lots of wonderful sweet treats plus some spicy sauce. I myself can be a little bit sweet and a little bit spicy, so I thought that Smita's selection was perfect. Smita's note was written on this lovely paper, in which she gave some background to the goodies that she sent to me, plus some history of the store where she bought them, Wegmans. I have been to a Wegmans once during a tour of the US, and loved the fact that it was so huge (and sold cut-price brand name cosmetics!!). A huge bottle of Dinosaur Bar-B-Que "sensuous slathering sauce" from a popular Rochester, New York watering hole of the same name. A bottle of New York maple syrup - maple syrup is very expensive here and I love cooking with it, so I am stoked about this! A packet of Paul Newman's own chocolate wafers - don't you love the packet design!! I have also now had my question asnwered about what "wafers" are in the US. A lot of US recipes use wafers, but here, a wafer is a thin, multi-layered flaky biscuit interposed with thick icing, which you could not use for a cheesecake base or a trifle. And last but certainly not least, a block of Ghirardelli Toffee Interlude chocolate - which is a deep, dark chocolatey experience spotted with crunchy toffee - yum!!!! Thanks so much Smita! Also, a big thanks to Stephanie at Dispensing Happiness for carrying out the not-so-small task of organising Blogging by Mail. Whether you are young or just young at heart, you have to admit that marshmallow rabbits are a cute and delicious way to celebrate Easter. I made the family of rabbits (plus one flower) above for my work colleagues and friends. Put the gelatine in a bowl and combine with the cold water. Leave to sit. Bring the sugar and hot water to the boil, then pour over the soaked gelatine. Beat the mixture until thick and white and cool, add colourings and flavourings (if desired) and pour into well-buttered moulds. Allow to set for at least 24 hours before turning out, painting details with food colours and rolling in coconut. Ann at Redacted Recipes is hosting this month's Mini Pie Revolution, and to give our teeth some respite from sugar, she has chosen Mini Pot Pies as the theme. Your pie can be any savoury combination, so long as it is mini and has a crust (and is therefore a pie). I have chosen to make single crust chicken and leek pies in ramekins for my entry. The recipe for these pies is from The Australian Heart Foundation's The New Classic Cookbook by Loukie Werle. The only changes that I made to the recipe that are worth mentioning were to add green capsicum to the filling (because I had one in the crisper that had started to curl up its toes) and to sprinkle poppy seeds on top (simply because it looks pretty!!). Preheat your oven to 180 degrees Celsius. Warm the oil in a frypan, then add the onion and capsicum and cook gently until soft. Add the mushrooms and continue to cook until the mushrooms are soft. Finally, stir through the tarragon, remove from the heat and place the onion mixture in a large bowl. Next, bring the stock, water and bay leaf to the boil in a pan. Add the chicken and the leeks and simmer until the chicken is cooked through. Pour in the peas, stir through until heated, and then remove the pan from the heat. Drain the mixture, reserving one cup of the liquid, discard the bay leaf and add the solids to the bowl containing the onion mixture. Make a paste with the cornflour and 1 tablespoon of cold water. In a small saucepan, stir the cornflour paste through the reserved stock, bring the liquid to the boil and simmer for one minute. Pour the resulting liquid into the chicken and vegetable mixture, combine thoroughly and spoon equal portions into 6 ramekins. Spray cooking oil between every two layers of filo pastry, and cut 6 rounds from the filo to cover the top of each of the 6 ramekins, leaving a slight overhang. Place a filo pastry "lid" on top of each ramekin, scrunching decoratively around the edges to seal the top, and spray each "lid" with cooking oil. Finally, sprinkle the top of each pie with poppy seeds, and bake in the pre-heated oven for about 30 minutes. Serve with mash on the side. Delicious! Thanks to Ann for hosting this month's Mini Pie Revolution, and don't forget to check Ann's site for the roundup at the end of the month. 17 March is St Patrick's Day, a day celebrated all over the world by the Irish and the Irish at heart. Saint Patrick, the patron saint of Ireland, died on this day on which his life is now celebrated. For a summary of the history of Saint Patrick and St Patrick's Day, you can look here. I am a lover of steamed pud from way back, so I'm up again for The Great British Pudding Challenge hosted by Rosie from Rosie Bakes a Peace of Cake. This month's challenge is Canary Pudding, so named for its soft yellow sponge and lemon flavouring. This pudding could have golden syrup, jam or lemon curd on top. I chose blood orange marmalade as a tart contrast to the sweetness of the sponge. The verdict - a light, fluffy sponge pudding that is miles away from the much-maligned reputation of puddings as stodgy. In this photograph, the pud is accompanied by vanilla yoghurt, but icecream, cream or custard would go equally as well as an accompaniment. It could also be served hot or cold, perhaps as an alternative on the afternoon tea tray. Delish! This post was meant to feature the red velvet black and white cookies that Cakespy posted for Valentines Day, from an edition of Every Day with Rachael Ray. And sure, these are red velvet cookies. They are just not red velvet black and white cookies, because Cakelaw did not realise until 10.30pm last night that she had virtually no icing sugar left to make the white icing. Accordingly, these cookies have transformed into red velvet cookies with chocolate icing. I had previously made black and white cookies, having been introduced to this phenomenon by Nic at Baking Bites. However, I was keen to try the red velvet experience, because I have seen so many people post about red velvet cake and how much they love it. (I had never heard of red velvet before I started reading blogs, because like black and white cookies, you don't really see it in Australia.) I decided that these cookies would be an easy introduction to red velvet, because they are smaller than a cake and therefore there is less overall red. Still, I was mildly shocked when I added the red colouring, which unsurprisingly turned the batter a very vibrant red. The interesting part about it for me is that when the cookies had baked, they turned a deep, mellow shade of red - phew! These cookies are huge - the recipe is only meant to make 10 cookies, and I ended up with 15 of varying shapes and sizes. (I need to work on my technique with this one, as it is a little like making pancakes.) They bake up nice and soft, like black and white cookies are supposed to be. The chocolate icing also tastes very nice, consisting as it does almost entirely of chocolate. Although I cannot speak for the white icing, I am sure that it would taste great too! If you are looking for a fun cookie to make that is a little different from the every day, I can recommend giving these cookies a go. Next step - the red velvet cake! Kitchen Parade is hosting a one-off event called Pi Day to honour pi, the mathematical constant approximating to 3.14. In a wonderful play on words, to participate in Pi Day, you must make a pie with a home-made crust and post about it between March 10 and March 14. I have mentioned previously that one of my favourite food magazines is Cuisine, a Kiwi publication. While flicking through Issue No. 127 (March 2008), I spotted a lovely sounding recipe for a single crust blackberry and apple pie by Ginny Grant on p102. I am a sucker for a fruit pie, so I have chosen to make this pie for my Pi Day entry. To make the pastry, blitz all the pastry ingredients together in a food processor until they resemble coarse breadcrumbs. Press the pastry into a disc and refrigerate for 1-2 hours. While the pastry is chilling, peel, core and slice your apples into wedges. (I used my fantastic $2 shop gadget that cores and slices in one go.) Melt the butter in a large frypan, then add the apples and sugar and cook the apples until they are soft. Add the blackberries and brandy and stir lightly so as not to break up the blackberries, then finally, sprinkle the fruit mixture with the cornflour and mix through to thicken slightly. Place the pie in the preheated oven for 15 minutes, then reduce the heat to 180 degrees Celsius and continue to bake for roughly another 30 minutes until the pie crust is golden. 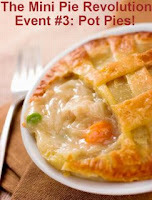 Allow the pie to cool to room temperature before serving. The highlight of this pie for me was definitely the fruity filling. Cooking the fruit prior to baking gave it a marvellous depth of flavour, and the smell and colour of the cooking fruit was delightful. I was not so enamoured of the crust, and if I made this again, I would probably use a standard egg pastry, and perhaps give it a double crust. Start with the amount of flour stated in the recipe when making pastry. If it is too sticky to form into a ball, add more flour; if it is too dry, add cold water tablespoon by tablespoon until the pastry is of the right consistency to work with easily. Refrigerating pastry wrapped in clingfilm for roughly half an hour makes it easier to roll out. I find it easier to roll out pastry on a sheet of lightly floured greaseproof paper. This stops the pastry from sticking to the bench, and makes it easier to lift once rolled out. If I find a particular pastry is hard to roll out without sticking to the rolling pin, I find that rolling out the pastry between two sheets of greaseproof paper is helpful. The greaseproof paper on which you rolled out the pastry can be used to lift the pastry into the pie dish without breaking. Draping the pastry over the rolling pin also helps with lifting it. Try and avoid making pastry on a hot or humid day, as it makes the pastry very soft and almost impossible to work with. If it is very difficult to line the pastry pan with a particular pastry in one piece (eg because the pastry is very soft), then you can always patch up any holes with leftover pastry and smooth over the patches with your fingers until they meld into the crust. I find a food processor invaluable in making pastry, because it cuts out a lot of the elbow grease in rubbing butter into flour, and is much quicker. Partly for this reason, partly because it produces a great tasting pie crust that doesn't compete with the filling, and partly because it doesn't shrink much, I like to use this pastry recipe from Exclusively Food for sweet pies. Thanks to Kitchen Parade for hosting Pi Day, and do check out the progressive roundup of pies here. It's Blog Party time again over at Stephanie's Dispensing Happiness, and this month's theme is Pizza Party. That's right folks - bring along a bite-sized pizza and a matching drink to join the party. Thanks to the hostess with the mostest, Stephanie, for hosting Blog Party, and I look forward to the party roundup later in the month. Danielle of Habeas Brulee is hosting this month's Sugar High Friday, and has selected Sweet Gifts as the theme. The gist of this theme is to make a dessert for someone, and share the story of why you made that particular dessert for that particular person. For my entry, I made a rum baba for my friend, Charet, who invited me to stay at her house in a beachside suburb for the Labour Day long weekend. Rum baba is one of Charet's favourite desserts, so I decided to make it for her as a gift for her generosity in having me to stay. Until Charet mentioned rum baba, I had never heard of it, and I didn't actually know what I was making when I started this project. Some research on the Internet informed me that rum baba is a rum-soaked yeast cake, sometimes served with cream and fruit. 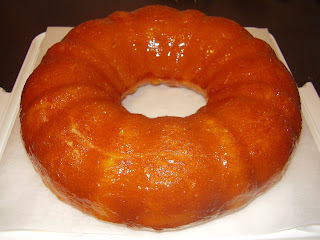 There were a lot of different recipes on the internet for rum baba, all generally along the same lines, but some contained dried fruit while others which did not. I opted for this version of rum baba, adapted from an Ina Garten recipe. However, I didn't bother with the cream, and I left out the rum-soaked currants (which turned out to be the right move!!). I was rather scared that the cake would fall apart after being drowned in all that rum syrup, but amazingly it didn't - so if you make it, don't be shy! Thanks to Danielle for hosting this month's SHF, and do check back to her site for the roundup later in the month. Emiline of Sugar Plum is hosting a St Paddys Day Pub Crawl, and is inviting us all to come along. To join the fun, you only have to cook a sweet or savoury dish containing booze (it is, after all, a pub crawl!) and post about it by March 17th. There is contest to win a great prize if you are creative. Brown the pork on all sides in a small amount of cooking oil in an ovenproof dish that has a lid (or just do what I did and use a frypan and subsequently transfer the browned meat to a casserole dish). Skim off any excess fat that cooks out of the meat. Once the pork has browned, pour the brandy and cider over the pork and into the pan over high heat, and toss in the onion, carrot, garlic, rosemary and stock. (Tip - Don't be too precious about how you cut up the veges, because you don't eat them - they are used for flavour only.) Once the liquid is boiling, remove the dish from the stovetop, cover the pork with baking paper, and cover the dish with the lid. Place the covered dish in the pre-heated oven and cook for 1 1/2 hours or until the pork is cooked through, turning the pork every 30 minutes during cooking to ensure even distribution of flavours. Once the pork has finished cooking, lift it out of the dish, wrap it in foil and put it aside to rest while you make the gravy. Strain the pan juices, then add them to a pan with the knob of butter, the flour dissolved in enough water to make a smooth paste, and the mustard. (Stephanie directs you to make a roux with the flour and butter then add the other ingredients, but I stuff this up 100% of the time, including this time, so I find that the paste method works better for me.) Stir your gravy until it thickens and just reaches boiling point, then remove from the heat. Serve slices of pork drizzled with the gravy. To accompany my pork, I made a beery warm potato sald, the recipe for which can be found here. 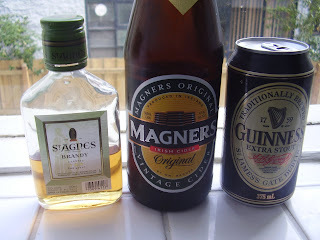 I left the onions and parsley out, used white vinegar in the dressing, and of course, used Guinness in the dressing. Both dishes were fantastic comfort food, and contained plenty of booze! Thanks to Emiline for hosting this St Paddys Day pub crawl. Be sure to check out the other pub crawlers at Emiline's site here. Zorra at Kochtopf and Fiordisale are hosting a blogging event for International Women's Day today, 8 March 2008. To participate, Zorra and Fiordisale have asked us to make a yellow dish. The yellow represents the colour of mimosa (wattle) flowers, which are given as a sign of respect and an expression of solidarity with women in their support for oppressed women worldwide. 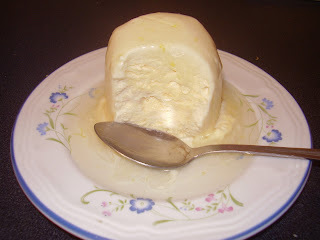 For this event, I have made lemon semifreddo with limoncello syrup from the March 2008 edition of Delicious magazine. The recipe is by Margaret River Providore in Willyabrup, Western Australia. I can honestly say that this is one of the most delicious things that I have ever made. It is absolutely devine. If you make it, do not skip the limoncello syrup - this really makes the dessert. To make the semifreddo, place the sugar, lemon zest and lemon juice for the semifreddo in a saucepan and heat it, stirring continuously, until it develops a syrup-like consistency (~ 10 minutes). Remove from the heat. Beat the egg yolks in a mixing bowl using an electric mixer until "fluffy", then while the motor on the mixer is still running, pour the syrup-like mixture into the yolks, and continue beating for aorund 10 minutes until cool. Whip the cream to soft peak stage, then fold int the egg yolk mixture. Spoon the mixture into 4 dariole moulds lined with cling film, cover the tops of the moulds with more cling film, and freeze for a minimum of four hours. To make the limoncello syrup, put the sugar, vodka, lemon juice and zest into a suacepan and bring to the boil. Simmer for 5 minutes until thickened into a syrup, then remove from the heat and allow to cool completely. When serving the semifreddo, place each unmoulded semifreddo on a plate and pour over some limoncello syrup. Do check Zorra's and Fiordisale's sites for the roundup of other dishes celebrating International Women's Day. Let's celebrate great women everywhere! Champaigne Taste and Briciole are hosting Novel Food: Spring 2008. 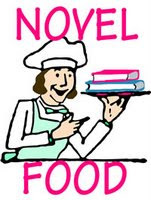 To participate, it's simple - prepare a dish that is connected to a published literary work and post about it by 22 March 2008. When I read about this event, the first book that popped into my mind was The Magic Pudding by Norman Lindsay. (For art lovers, the author was also a famed Australian artist, who was the subject of the film Sirens.) While The Magic Pudding is regarded as a children's book, there is much academic discussion about the hidden symbolism and meaning behind the plot and characters. The "magic pudding" of the title is a walking, talking pudding with stick- like legs called Albert. 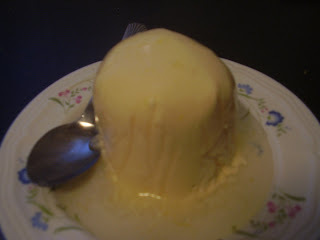 In addition to having an unpleasant personality, this pudding is magic because (a) it is literally the pudding that never runs out - when you cut a slice, the pudding regenerates itself; and (b) it is a steak and kidney pudding on one side, and is jam roly poly and apple dumplings on the other side. As I have never made a savoury steamed pudding, let alone one with a suet crust, I made a traditional steak and kidney pudding in honour of The Magic Pudding for this event. 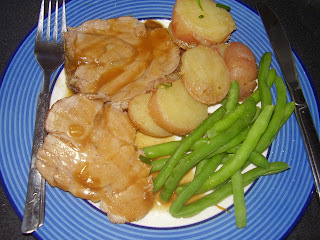 I used Delia Smith's recipe (sans the extra gravy), which can be found here. Delia mentions that the cockney slang for steak and kidney is "Kate and Sidney" - I think this is really cute! This pudding was, to my surprise, delicious. The crust was "melt in your mouth", and the filling was rich and flavourful. I would definitely make this again at some point in the future. Thanks to Champaigne Taste and Briciole for hosting this event, and please check their sites after 22 March for the orundup of literary-inspired food.